When it's not blowing dogs of chains and raining cats and dogs, the weather on Lord Howe Island is mostly stable. We get most of our windy weather in the winter time from June to September, the direction of the wind being from the north west to the south. During summer from October to May the wind comes from the south east to the north. Winter time is becoming very popular now with kiteboarding and windsurfers using Lord Howe's pristine lagoon. Contact Us if you need more info on Kite Surfing ( kiteboarding ), Windsurfing or Hang Gliding. Click here to go to our kiteboarding page where you can see a video about kiteboarding in the lagoon. 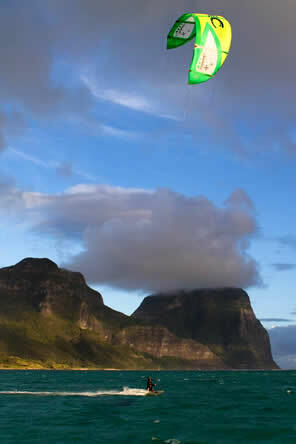 Click here to see a birds eye video of Jack Hang Gliding at Lord Howe Island. Lord Howe Island is lucky to be situated in a warm current of water that breaks away from the east coast current. This means that the water temperature stays between 18°C and 26°C. Lord Howe Island has the most southern coral reef system in the world. This keeps the climate temperate. The summer time temperature varies between 20°C to 29°C. report about the climate on Lord Howe. meteorological changes on the island and he informs me that the highest range of the thermometer he has noticed is 82°F in the summer and the lowest 52°F in the winter, a result that cannot be obtained in any other part of the world...."
Lord Howe has regular rainfall with an average of about 1.5m per year. Winter time being the wetter months.